Plus Size Beaded Tops are not only for special occasions, they are also very popular in causal wear right now. So no matter if you need one for an elegant event or you just want to dress up your jeans, there is a great selection available. Beaded and Sequined tops are available as formal wear, to wear with an elegant skirt or plus size special occasion or palazzo pants. They can also be found in fashion tops that are embellished with beads or sequins that are suitable for everyday or "non-formal" special occasions. I always love to wear beaded tops around the hoildays. You can even find tee shirts that have been beaded or embellished. One of my favorite looks is to wear a beaded or sequined tank top with my black pants suit for occasions that are special and require dressing up (like a dinner party or wedding). I can get a whole new outfit for the price of one new item. Add your dressier jewelry and shoes and you will look fantastic. are a great option for special occasions. You can add a nice skirt or pair of pants and have a great ensemble. While not in plentiful supply, there are some very nice options available. These tops are much more plentiful in the fall and winter months than in the warmer seasons. Another option is to go with an ensemble that features a beaded top - as the one pictured below. You can see more here - Plus Size Cocktail Pants Suits. are very popular right now, especially sequin tank tops. I just love these - you can wear them with jeans for a fun look, with a suit to dress it up or with dress pants or a skirt for a special event. This one item can work with many pieces that are already in your wardrobe. Although the most prevalent colors are gold and silver, you can find these in a variety of colors right now. are another fun item that you can dress up or down. You can find styles that will be perfect for a night out on the town all the way to formal wear. 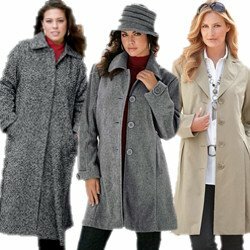 These are also easier to find in the fall and winter seasons than in the warmer months. I love to wear an embellished tunic with jeans and heels for a great look. I have also worn them with black pants to a very dressy event. can add a lot of fun to your everyday wardrobe. 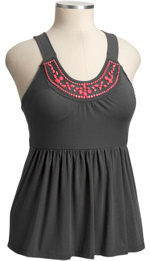 You can find beaded fashion tops in everything from tank tops to tunics, including tee shirts. Usually the beading is either earth toned or brightly colored - generally you won't find sparkly or rhinestone beads on casual wear - but there are always exceptions. Plus Size Beaded Tops can be a great addition to your wardrobe collection. The look and texture of beads is gaining a lot of popularity right now, particularly for formal wear. Beyond being popular many beaded items, including tops, can actually appreciate in value over the years – they are somewhat collectible. Beaded tops make great gift items. When you wear them they certainly make an elegant statement particularly when paired with the right skirt or pants and a matching pair of shoes. Beaded tops come in a wide variety of colors and fabrics too – meaning you can find one that expresses your mood and the occasion perfectly. Parties are among the many places that wearing beaded tops helps you stand out from the crowd. Beads that shimmer slightly in the light draw the eye and give you a special glow. If you're at a flashy affair don't be afraid to pair your top with large bracelets, noticable earrings and perhaps a large stone ring. While common convention advises wearing black beaded tops for a sllimming effect this is a bit of a myth. Any darker tone top has that effect. Look for a beaded top that looks great against your skin and perhaps has beads in a color that shows off your eyes. Pair the top with a streamline skirt or pant with just a little flair to offset a large hip line. Petite plus – stick with tops that stops at your hip. Anything longer than that “shrinks” you. And ladies don't forget proper undergarments. Many women wear the wrong size bra that in turn makes your top look “off”. No matter how expensive the beaded shirt, a proper bra will help it look even more stunning. One very important note in shopping for plus size beaded tops – check the manufacturing carefully. Look and see how the beads have been attached and how secure they are. The best tops are those with individually set beads (i.e. if one comes loose you don't end up with an entire line of beads falling off). Along these lines, it's strongly advised that once you buy a top or two, you hand wash or dry clean any beaded attire to keep it in good shape. A dry cleaner can often catch a loose bead and re-secure it for you in the cleaning process. These are beautiful pieces of wearable art – so treat them kindly.